This 15in notebook computer is designed to be something that can be used by everyone at home, from parents emailing and working, to children using the internet and playing games. 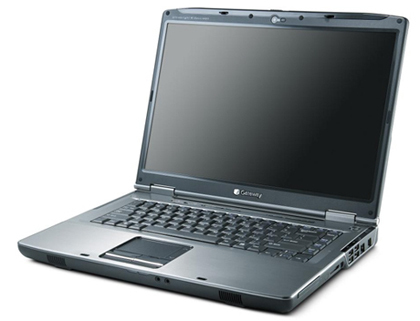 It uses a Pentium Dual Core T2310 processor which runs at 1.47GHz. That’s a reasonable speed, which is fast enough for most of the tasks for which this computer’s going to be used, but if you try to edit video or play recent games the MT6724b might start to struggle. It comes with 2GB of memory, which certainly helps, and which helped the computer to a decent showing in our lab testing. The Intel graphics processor, which is contained on the motherboard rather than on a separate graphics card, is reasonably capable again, and comes with 128MB of its own memory, as well as being able to borrow 230MB from the aforementioned 2GB if it’s dealing with a fast computer game, for instance. Overall performance was fine, though, and certainly for general day-to-day use it’s perfectly capable. Playing back a DVD didn’t present a problem, either, and nor did the built-in Windows Media Center software which can be used with a TV tuner to watch and record programmes. There is a 150GB hard disk, of which 10GB is used by the Gateway recovery software, which is used in case something goes badly wrong and the computer has to be wiped and restored to its default settings. The 15in screen is a widescreen model, with a resolution of 1,280×800 pixels. That’s not particularly high, meaning that levels of detail are not as good as on sharper displays, but it’s still perfectly useable, and it does have the side-effect that text is bigger by default on this screen than it would have been on a higher-resolution one. It is a model without anti-glare coating, however, so although it has good contrast and brightness, it’s susceptible to glare in bright light.